A real efficiency booster, Lexmark’s innovative MyMFP feature lets users save and retrieve their personal settings on a simple flash drive, including their local address book, personal fax numbers, individual copy settings, and even their own touch-screen configuration. They simply walk up to the MFP, slide in their flash drive and the MFP literally transforms into their own personal device. A warm welcome each time they use it! Take a load off your IT department. These devices are network-ready and very easy to set up. If you have multiple Lexmark devices installed, the Lexmark Universal Driver offers even easier deployment. Once up and running, on-screen custom messaging makes life simpler too by providing users with crystal-clear information, like ‘Toner low, call placed’. What’s more, Lexmark MarkVision Professional software provides simplified remote management and automated tools to keep your workday flowing! If you’re still struggling between multiple devices across your office – printers, scanners, copiers and fax machines – then your true productivity potential is still out of reach. But with Lexmark’s advanced multifunction technology, there’s an easy fix! Experience more productivity than you could ever imagine! 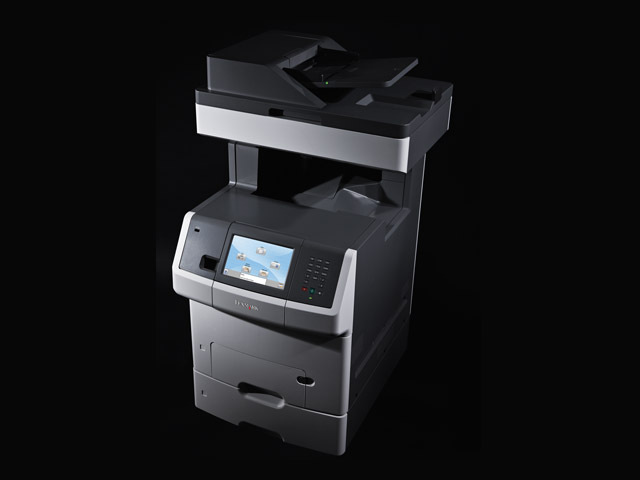 Lexmark’s new multifunction devices come solutions-ready. That means they can be customised easily to meet your unique printing needs. Contact your Lexmark representative to find out how simple it is to tailor your MFP with one or more of Lexmark’s leading industry solutions. With the touch of an icon you can transform your hardcopy documents into digital workflow, helping you print less, save time, lower costs and reduce the environmental impact of printing. Solidly robust and competitively fast, Lexmark’s colour-laser MFPs let you unite all your critical document functions into one high-performance solution. And the benefits go far. The Lexmark X730 Series is equipped with state-of-the-art security to protect your valuable corporate data. It also features customisable user-access controls, allowing you to enable or disable functions with ease. Like all of Lexmark’s business-class printers, the Lexmark X730 Series comes standard with Lexmark’s solid guarantee of 1-Year Onsite Service, which provides you with next-business-day response. But you can also extend your guarantee further with a customised offering to match your specific needs. This can cover everything from guarantee extensions (up to five years) and faster response time (as little as four hours) to installation, training and much more. A simple touch of the extra-large and intuitive colour touch screen is all it takes to move your workflow into high gear. 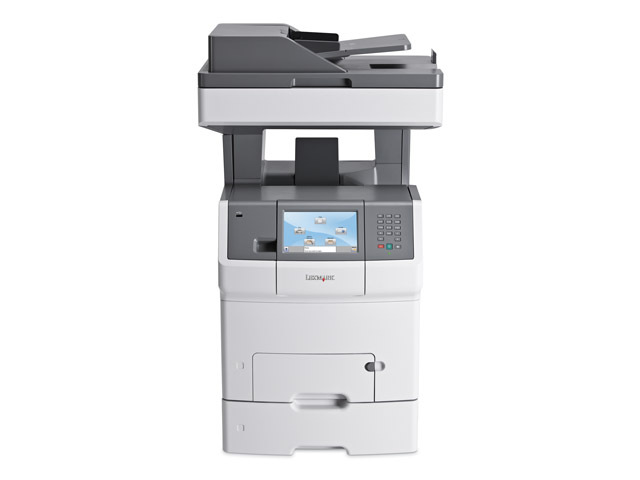 You get fast, high-quality colour printing, copying, faxing and scanning – all in one multifunction workhorse. What can Lexmark colour multifunction do for your business? By operating and managing fewer devices, you’ll optimise office space and save money on hardware, consumables, service contracts and even electricity. Plus, you’ll have all the office tools you need to make real productivity gains. Combine that with brilliant Lexmark colour that empowers your documents, and there’s virtually nothing you can’t achieve. Lexmark's 1-Year Onsite guarantee on the Lexmark X730 Series provides added peace of mind. Enhanced service offerings may be available by contacting your Lexmark representative or visiting www.lexmark.com. Optimize your printer's performance and investment value by using genuine Lexmark supplies, service and parts. If you want to make an impact with colour but need the competitive advantage of multifunction efficiency too, then get to know the Lexmark X738dte. It not only prints, copies, scans and faxes in both black and colour, but also provides outstanding performance and value. You can count on speed and reliability, versatile paper handling, customised solutions and a rich range of features – all easily accessible via Lexmark’s award-winning colour touch screen. Experience the giant benefits of a colour copier, without the giant size and price! When you email a large file from your Lexmark X730 Series MFP, it won’t cause a traffic jam on your network. That’s because traffic-shaping technology can partition your network traffic and designate lower bandwidth for outbound flows. This is especially useful for busy networks and externally hosted Web servers. Whatever you want to print – from presentations and reports to labels, envelopes and even banners – the Lexmark X730 is the perfect partner. With its excellent print quality, powerful productivity and robust paper-feeding design, you’ll be fully equipped with the features you need to accelerate your workflow. Lexmark multifunction technology makes it easy to reduce the amount of information you print, copy and distribute in hardcopy format. You’ll save time, costs and office space, while powering fewer devices. Benefit from a rich range of advanced copy functions to boost your productivity, such as Priority Copy to interrupt long print runs temporarily; ID Card Copy to copy both sides of a card on to a single sheet; and Sample Copy (hard disk required) which lets you stop and take a good look at the first copy before releasing the rest of the job – a great way to save time and reduce paper and toner waste.